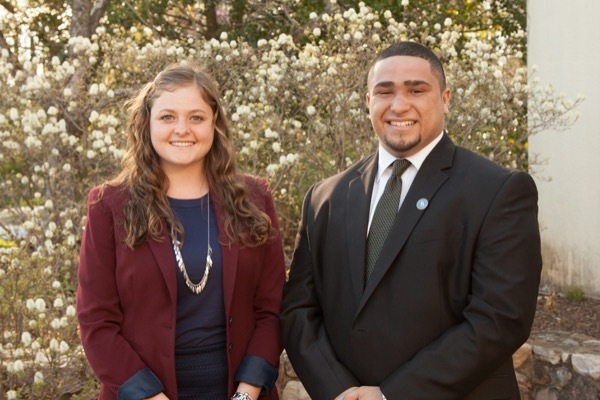 Seniors Rebecca Jaeger and Jonathan Galarraga have been selected recipients of the University of Delaware Alumni Association's Warner and Taylor awards. 9:29 a.m., May 4, 2016--Emalea Pusey Warner and Alexander J. Taylor Sr. set the bar high for those who would follow in their footsteps by exemplifying what it truly means to be a Blue Hen. Every year, the University of Delaware Alumni Association (UDAA) honors their legacies by recognizing one outstanding woman and man from the graduating class with the Emalea Pusey Warner and Alexander J. Taylor Sr. awards. This year, seniors Rebecca Jaeger and Jonathan Galarraga, both in the University Honors Program, have been selected as the recipients of these prestigious awards based on the leadership, academic success and community service they have each demonstrated during their time at UD. Emalea Pusey Warner Award recipient Rebecca Jaeger is a triple major in biology, history and Spanish. After graduation she hopes to pursue a career in public service as an attorney. Jaeger has also been named a UD Distinguished Scholar and a UD Woman of Promise, and received the University’s General Honors Award. She is currently the president of the Student Government Association and has served as a UD Student Alumni Ambassador, a Munson Fellow (a peer mentor in the Honors resident hall), a Senior Fellow and a Freshman Fellow. She has worked as a Writing Fellow for the Honors Program since she was a junior. Over the past four years, she has also interned with the state of New Jersey and performed extensive community service. The recipient of the Alexander J. Taylor Sr. Award, Galarraga will be graduating this spring with an honors degree with distinction in chemical engineering. Next fall he will begin work on his doctorate at the University of Pennsylvania. While Taylor received numerous academic accolades and is known for his service on UD’s Board of Trustees, Galarraga too has displayed similar success inside and outside of the classroom. He is a Eugene du Pont Distinguished Memorial Scholar, funded by the Unidel Foundation, and between 2014 and 2015, he was endorsed for the Truman scholarship, the Rhodes scholarship and the Marshall scholarship. He has also held leadership roles in organizations like the Hispanic Professional Engineers, the American Institute of Chemical Engineers and the Deep Roots Outreach Program. Galarraga has conducted research in the College of Engineering since his freshman year and is currently leading his own independent research project related to tissue engineering and drug delivery. With these awards, the UDAA seeks to commend students who have taken advantage of the many opportunities UD has to offer and grown into true change agents, global citizens and problem-solvers. “Like Taylor and Warner, Galarraga and Jaeger are both excellent examples of the life changing impact a University can have on its students,” a UDAA representative said. Emalea Pusey Warner (1853-1948) is best remembered on the University of Delaware campus as a champion of education. In 1911, she became chairperson of the State Federation of Women's Clubs' Committee on Education and worked diligently toward the specific goal of establishing a state-supported women's college. In 1914, she was appointed chairperson of the Advisory Council of the Women's College and later became the first woman member of the Delaware College Board of Trustees. Warner Hall is named in her honor. Alexander J. Taylor Sr. (1875-1940) entered Delaware College in 1889 and graduated in 1893 as class valedictorian, with a baccalaureate degree in civil engineering. Mr. Taylor was elected to the Board of Trustees in 1927, reelected in 1932 and again in 1938. He served on the Grounds and Buildings Committee and Executive Committee and was chairman of the Finance Committee. Taylor Hall is named in his honor. The Warner Award was first given in 1950, while the Taylor Award debuted in 1968. Recipients are recognized with a $2,500 award, are honored at a luncheon at the President’s House and lead the alumni delegates’ procession at Commencement. Additionally, the recipients are invited to speak at the annual Alumni Weekend presentation of the UDAA Alumni Wall of Fame awards. Visit the website to learn more and register for the event. All University of Delaware graduates are automatically granted membership in the UD Alumni Association (UDAA) upon graduation and are inducted with a pinning ceremony at Commencement. The UDAA is proudly dedicated to engaging the entire alumni community by fostering a tradition of lifelong loyalty and commitment to the University. The UDAA provides exceptional value and ongoing support to alumni worldwide by expanding benefits available to alumni, supporting regional and affinity club events, recognizing the accomplishments of students and alumni and more.